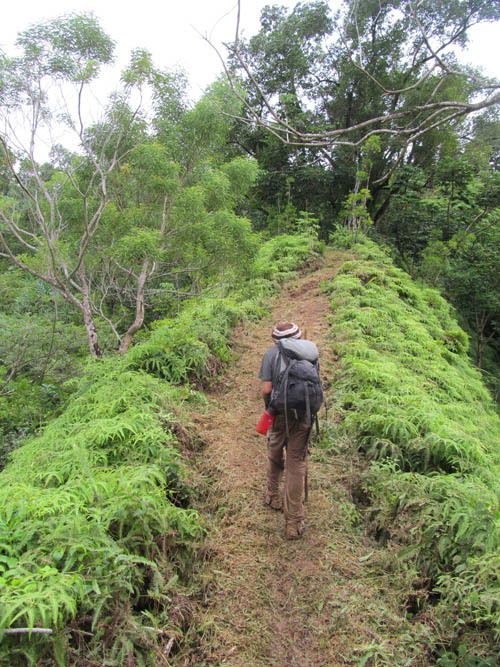 I joined the trail clearing crew of the Hawaiian Trail and Mountain Club to clear the trail that leads to the summit of Ohulehule from Kahana Valley. 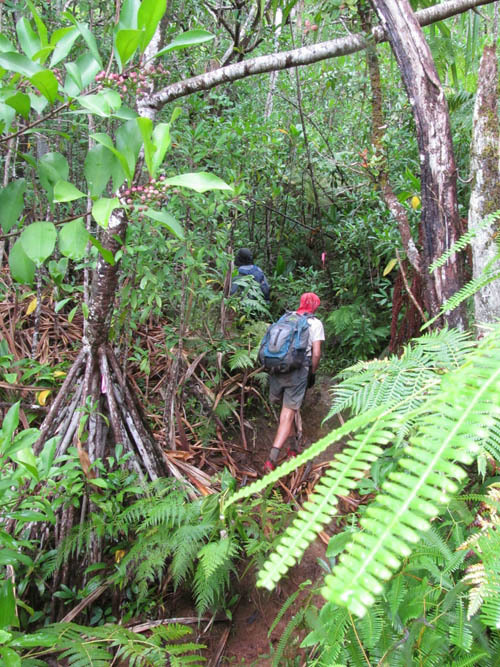 This was the second attempt in two weeks to clear the trail to Ohulehule. The crew was thwarted the previous week by big rain storms that flooded Kahana. But the weather was better today. Patches of blue sky over Ohulehule gave hope that the clouds would blow over. Especially hopeful was when the sunlight illuminated Ohulehule as I drove from Waikane to Kahana. 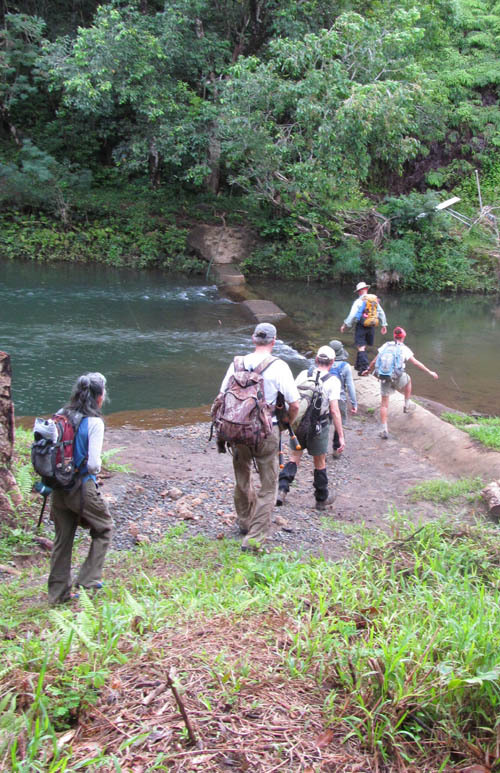 Kahana Valley was cloudy as we pushed-off from the parking area and made our way to the stream crossing at the dam on Kahana Stream. The water was clear and was flowing nicely over the dam at the usual water level. Just one week before muddy run-off overwhelmed the stream and dam crossing at this spot. 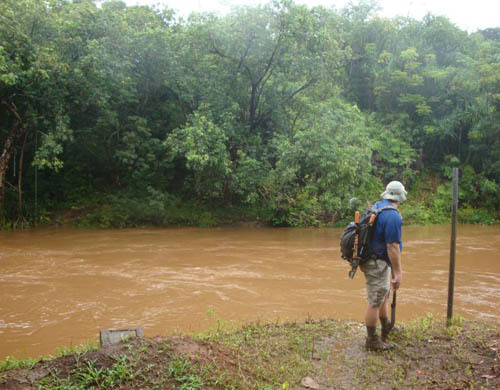 Photo by Thomas Yoza, Oct 16, 2011, one week before — John Braum at Kahana Stream Dam – stream crossing under 4 feet over fast flowing dark brown water. The previous week, torrential rain flooded the stream — the dam is not visible. John Braum told us that at noon the week before the stream level had risen to the last stone on masonry rock wall. The water flow was strong with eddies swirling at the surface. 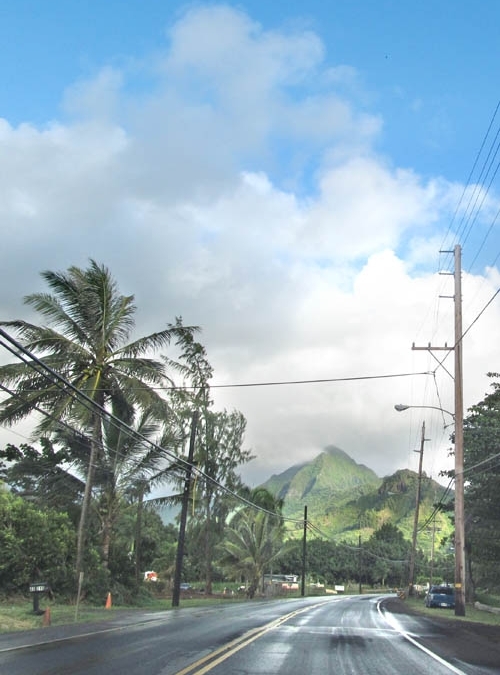 We were lucky today that the weather was much nicer today than it was last week when heavy rains hit Kahana Valley. The white line approximates the water level one week to the level of the last stone on the masonry wall. The torrential rains had flushed and cleansed the valley so thoroughly last week that the stream water today was nearly crystal clear. 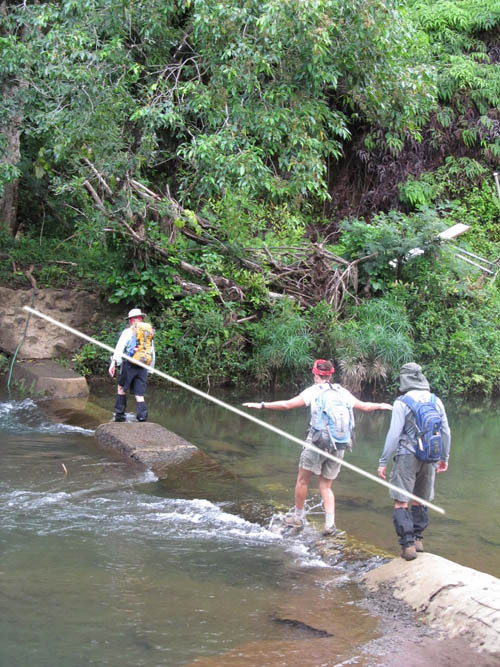 After making our way through a forest of invasive trees we got to the second stream crossing. 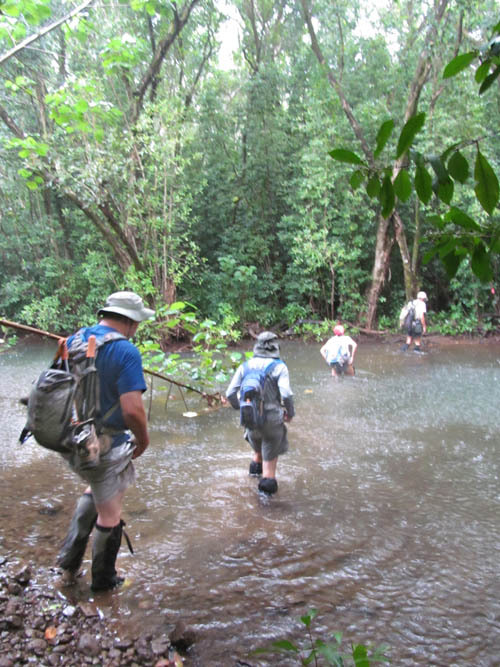 A rain squall blew in and blessed us with with rain as we made the second stream crossing. The water was much deeper than usual — last weeks rain scoured the stream bed. 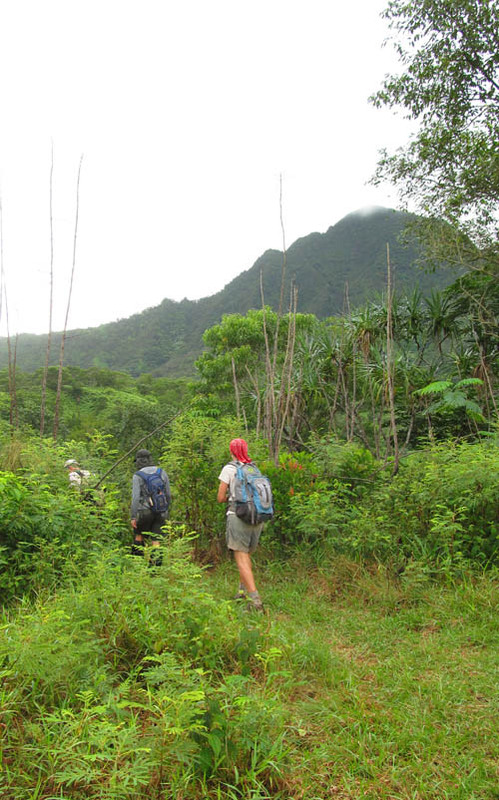 We hiked through groves of hala trees (Pandanus tectorius) which thrive throughout Kahana Valley along with uluhe ferns. 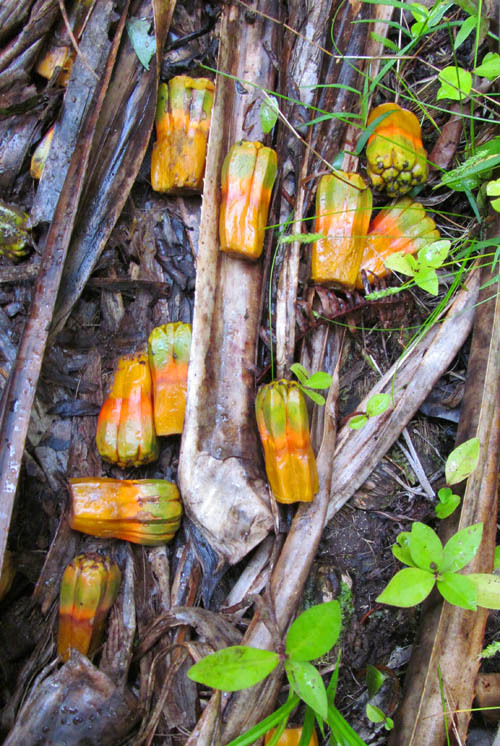 We saw a number of brightly colored hala fruit on the ground which had fallen apart and showed the color of the ripening fruit on the inside. When we reached the burnt clearing where koa sapplings dominate the landscape, we could see the summit of Ohulehule coming up to us. 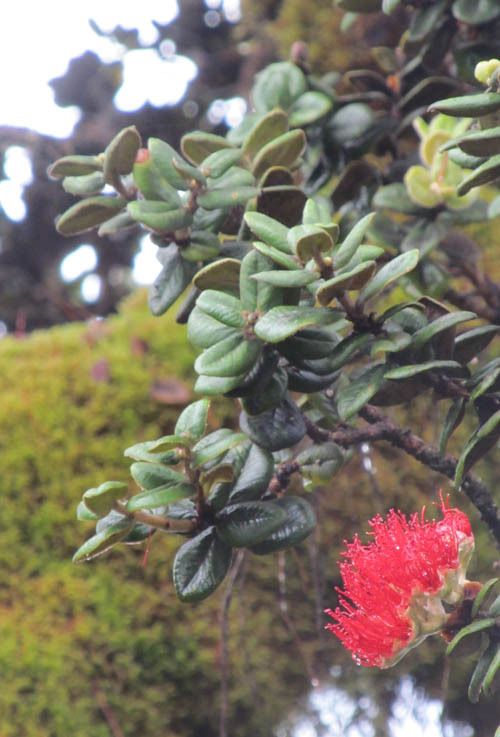 Some of the ohia trees reach impressive size and are covered with mounds of moss. 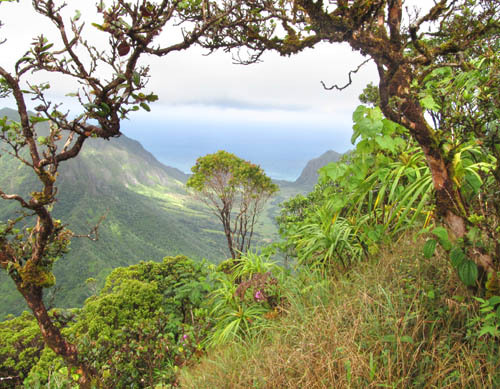 The seeds and foliage of Koa trees dangle over a uluhe landscape. One year ago, the trail was 4 feet wide. 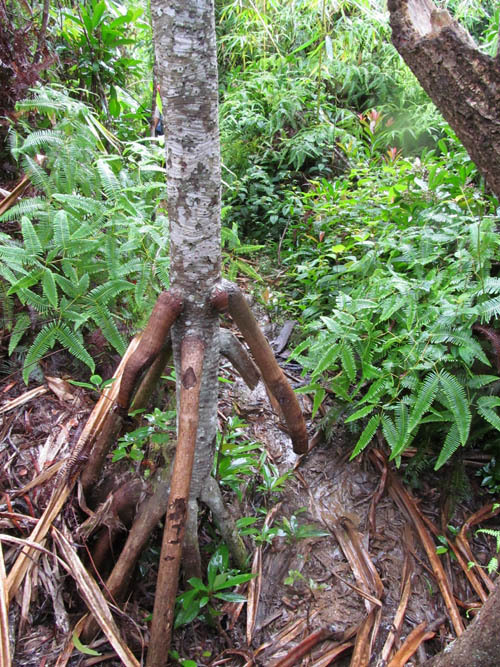 Although the trail was still very much passable I was surprised how thickly the uluhe had grown back in one year. Uluhe growth was so fast on some slopes that our forward progress was slowed by the thick growth. 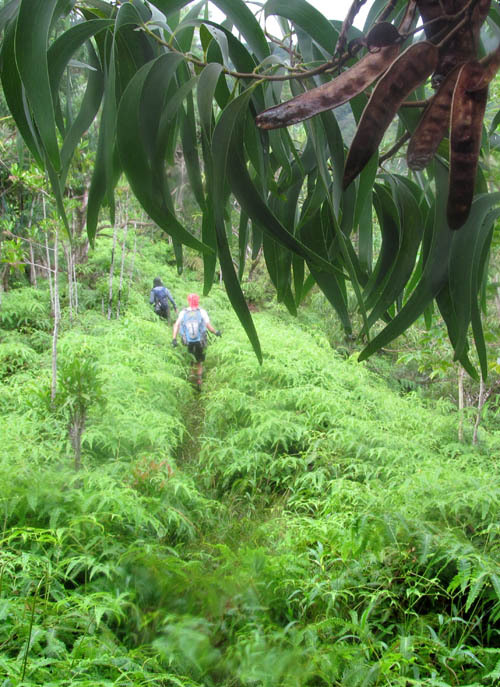 When we reached the ridge that leads to the Waikane Saddle, we began the slow climb up through groves of hala trees. 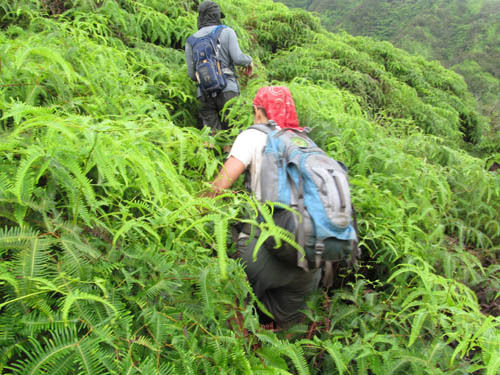 We hacked at uluhe, clidemia, and ardesia as made our way upslope. The views became better the higher above Kahana Valley we got on the trail to the Waikane Saddle. 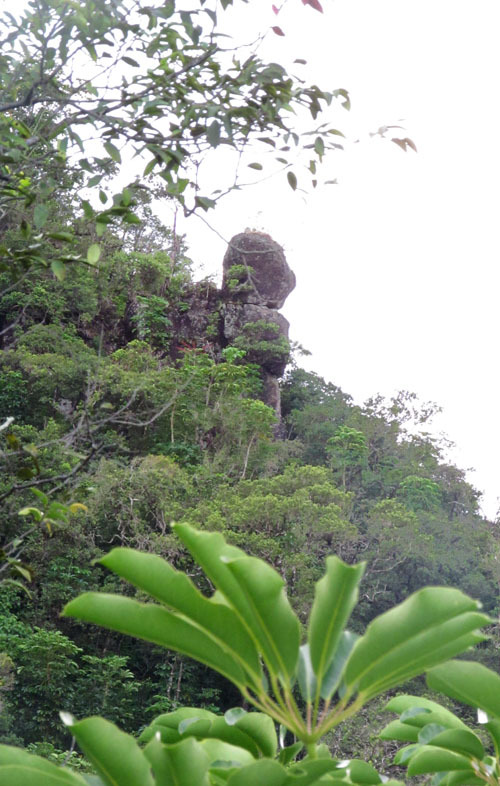 We were pleased to see the Kahana Sphinx on a neighboring ridge — a good omen to see on the way to Ohulehule. Several rain squalls swept in from the ocean and blew over Kahana Valley. Fortunately, the squalls did not last long and we had rain gear. The rain did however, make the climb much more muddy and slippery. 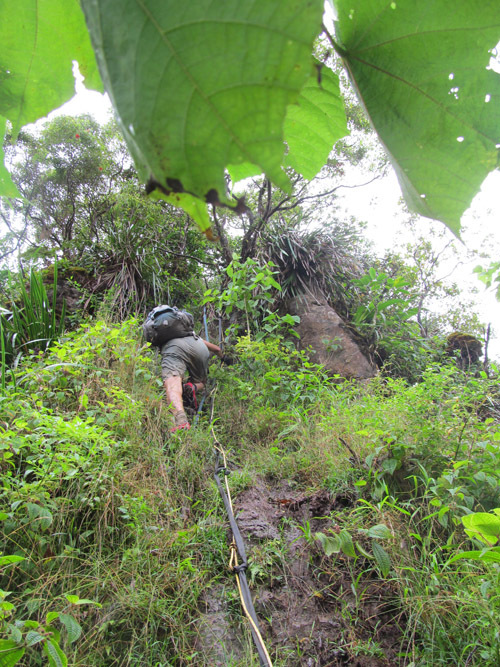 The steepness increased as we reached the summit and got to the rope/strap section — the steepest part of the climb. 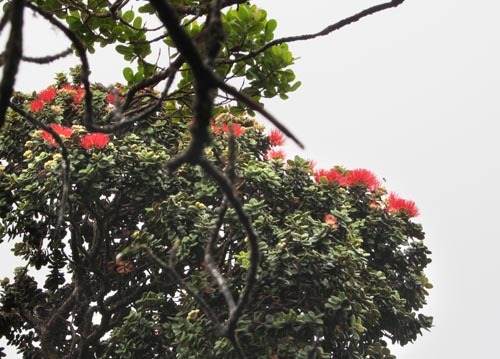 When we completed the steep climb, I saw lehua papa trees in bloom along the summit ridge to the top. The leaves of lehua papa (Metrosideros rugosa) are thick and furrowed. 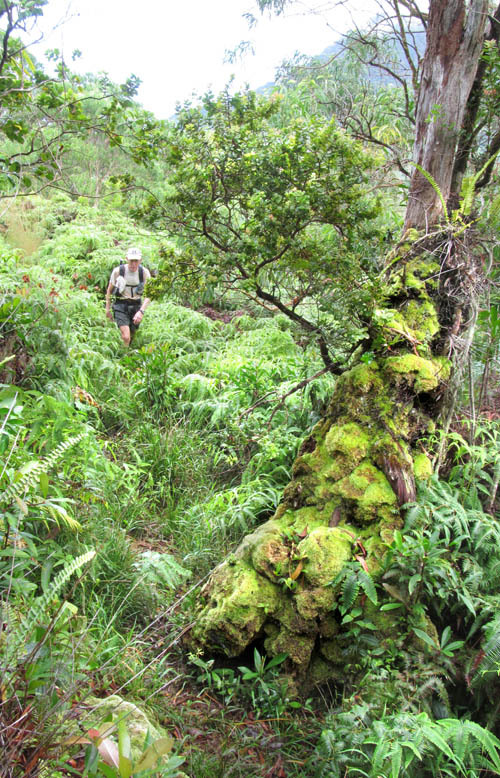 Clouds often shroud the summit of Ohulehule which favors the growth of moss on the trees. After a brief shower at the summit, the clouds opened-up! We were amazed to see how green the landscape was! 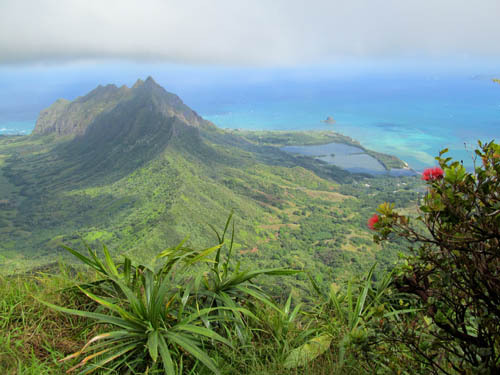 The view of Kanehoalani, Mokolii (Chinaman’s Hat) and Molii Fishpond with lehua and ieie in the foreground was awesome! Unfortunately, the clouds blew-in, blocked all views, and the time came for us to leave. 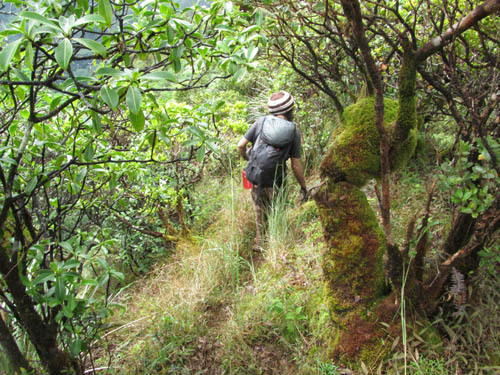 We descended through patches of kopiko trees some of which were covered in moss. After descending the ridge line to the valley floor, we retraced our steps back down the trail and saw the work of the weed whackers who blasted the trail 4 feet wide again. 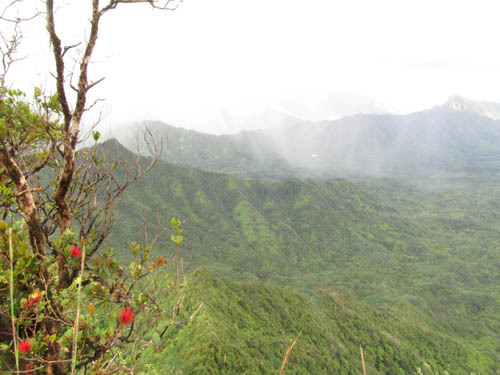 While making our way back to the stream crossing at the dam, I reflected on the great time I had clearing the trail to Ohulehule, seeing the Kahana Sphinx, and admiring the views between rain squalls. I am happy to report that the trail to the summit is wide open again!